More businesses are buying into BYOD and Apple Inc. looks poised to benefit most from the trend, new research shows. Figures collected by ChangeWave Research show the iPad is the topchoice among businesses considering buying tablets for their workers, PCMagazine reports today. Out of 1,604 business IT buyers surveyed, 22 per cent said they plan tobuy tablets for their workforce during the second quarter of 2012. 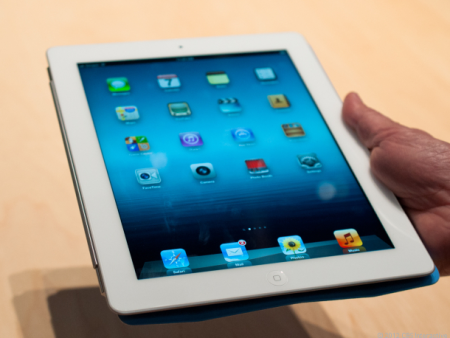 Ofthose who plan to buy, 84 per cent intend to purchase iPads, up from 77percent back in November. Apple’s iPads are the most popularbrand among businesses looking to buy tablets in Q2 2012. ChangeWave says it’s “the highest level of corporate iPad demand everseen” in one of its surveys. The findings indicate a probable“across-the-board decline in next quarter buying of tablets from othermanufacturers,” ChangeWave adds. Demand for Samsung tablets fell two points since November to eight percent in the ChangeWave study, while demand for other tablet brands alsoslumped during the period: Amazon was down one point to six per cent,while HP, Asus, Dell, RIM, Lenovo and Motorola all fell by one or twopoints each. Companies will probably have to wait to make large-scale purchases ofthe newest iPad since there’s a reported two to three week backlog inApple’s ability to meet demand for the upgraded version.